1. Place onion, garlic, coriander powder, cumin, mustard seeds, red chilli powder, whole red chillies and oil in a microwave safe dish and microwave for 4 mins at 100% power. 2. 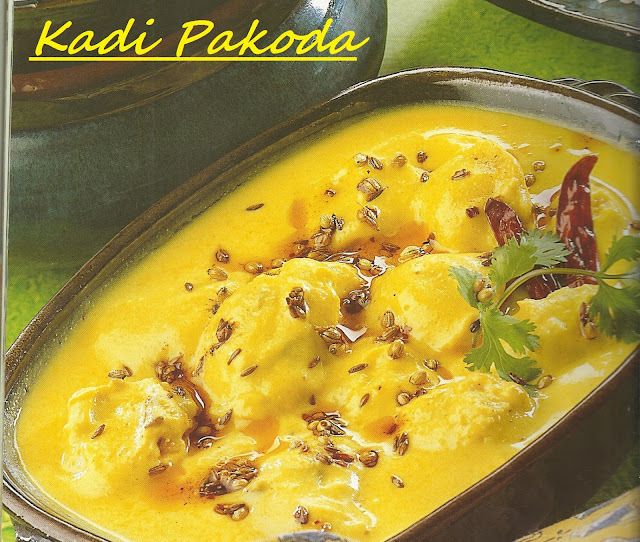 Add curd, gram flour, salt and turmeric powder and add it in tadka. Microwave at 70% power for 8 mins. Stir in between. 1. Mix all the ingredients properly .Grease a microwave safe idli stand. Place 1 tbsp batter on each mould and microwave for 5 mins. at 100% power. 2. Add these pakoras in kadi and microwave for 2 mins at 100% power. Garnish with garam masala.